Lamps Plus, the nation’s largest lighting retailer, introduces a new line of made-to-order lamp shades with custom trim. The decorative trim, available in a variety of eye-catching styles and colors, is hand-applied by artisans in the company’s California workshop. There are currently more than 70 shade and trim combinations, with more to come, available exclusively at LampsPlus.com. 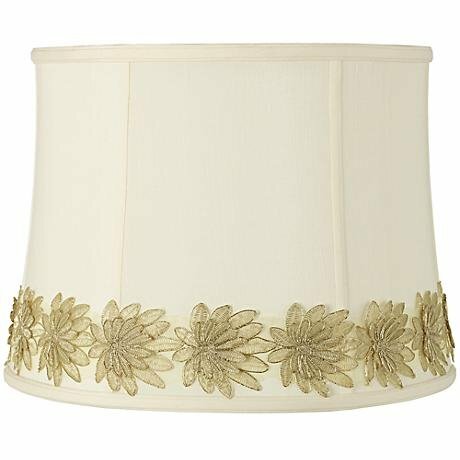 A lampshade featuring a delicate golden flower trim. The decorative trim lamp shade designs start at $39.99 and can be found alongside many other decorative looks in Lamps Plus’ wide assortment of beaded and trimmed lamp shades. The custom lamp shades with trim are currently available in three popular shapes: classically-influenced bell lamp shades, contemporary drum shades, and rectangular shades. The accompanying decorative trims come in a range of styles, from lace and ribbon weaves, to embroidered leaves and floral appliques. Many feature luxurious details like gold and silver metallic thread, intricately woven patterns, and rhinestone accents. Lamps Plus plans to introduce more trim options for lamp shades throughout 2015. Soon, the company will offer existing lamp bases topped with custom shades as well. Made-to-order merchandise has been a steadily growing segment of the Lamps Plus product offering. The new custom trim lamp shades join the retailer’s selection of thousands of custom designs, including patented giclee art shade lighting as well as the Color + Plus and Tiffany Color Plus lighting collections.